Harrahs Hotel & Casino - Las Vegas - rdmh ltd. 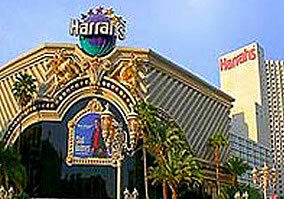 It's Carnival - all year long - at Harrah's Las Vegas! You'll find 2,526 themed rooms and suites, 86,664 square feet of casino space, seven outstanding dining outlets, a sparkling, outdoor swimming pool, luxurious spa facilities, a state-of-the-art health club a full-service beauty salon, a unique variety of retail options, and of course, entertainment. Harrah's attracts families seeking a diverse range of activities and entertainment as well as singles and young couples visiting Las Vegas for gambling and nightlife. True to the Carnival theme, the hotel's lobby and casino buzz with bright colours and excitement, day and night. This award-winning hotel features 2,526 deluxe guest rooms which include: Cable TV, with pay-per-view movies available, Dry cleaning and laundry services, Express check-out, Non-smoking rooms and accommodations for persons with special needs. Set in the middle of lush landscaping, you will find a sparkling swimming pool and spa which are located in the centre of this amazing resort. Relax and enjoy the warm and sunny atmosphere of Nevada, while you catch a few rays at this oasis in the desert.